Even if you somehow made it into the cinema without figuring out what that Z stands for, this film’s provocative opening images offer up an uneasy sense of what is to come. Director Marc Forster pairs the worst of man’s abuses of the planet – and Piers Morgan – with the vicious, ravenous cycle of the animal world. You immediately get the sense that humanity is about to be on the wrong end of those impulses. Shame that this chilling premonition of things to come merges into a stilted family conversation packed with exposition. Over breakfast we learn that Gerry Lane (Brad Pitt) had a very bad job going to very bad places to observe very bad people. Having resigned, he’s much happier now that he’s staying home and making pancakes for his two young daughters. Given that Gerry’s new role isn’t going to last past the next school run, we can forgive the script its contrived shortcomings as the action begins before cinemagoers’ bums have had time to get even a little numb. Like an illusionist working an audience, Forster quickly increases the tension, bumps up the sense of fear, throws in some explosions and then, as if by magic, zombies appear! It sounds hammy, but it’s here that the film does its best work. Fans of The Walking Dead will know that both the comics and TV series begin after the world has already gone to hell. Watching society crumble and the streets turn into a killing zone, all handled with a keen sense of pace, is a vicarious joy. The undead also move as quick as someone bitten by a Rage-infected monkey in 28 Days Later, which both accelerates society’s demise and allows Forster to punctuate the tension with quick-fire shocks. 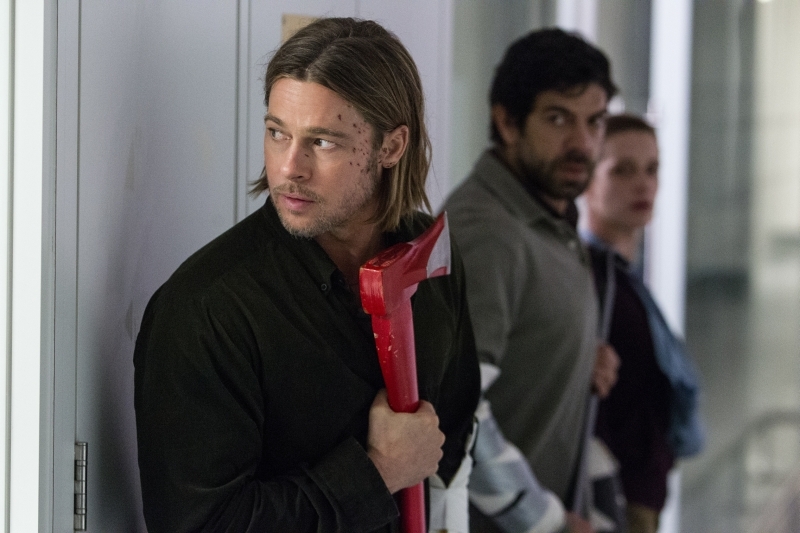 World War Z is loosely based on Max Brooks’ zombie novel of the same name, and the movie does eventually live up to the title and become a global conflict. “Every person we save is one less zombie to fight,” says an Israeli contact during a talky mid-point. Inevitably cranking the action back up, the film even manages to give zombies a new trick – which is no mean feat in a saturated market. Using their ability to attack ruthlessly and with no regard for their safety, the millions of infected mindlessly work together, like a beast created from many parts. At the centre of this disaster is Gerry, drawn back in to his old work to safeguard his family’s place on a warship at sea. It helps that the character clearly knows how to take care of himself, but still feels like a believable, regular guy, making his task of going up against a world gone mad all the more heroic. And yet, despite all the killing, the gore is somehow kept to a minimum. This bloodless end of times may annoy hard-core zombie fans, but that 15 certificate does at least bring the film to a wider audience. In the end, though, with its CGI spent and a quieter, more thoughtful outcome at hand, it lacks some of the bite that was evident in earlier, more tense scenes.